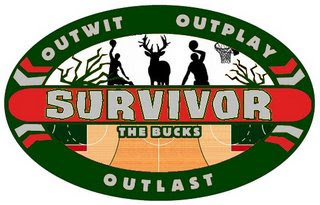 Bucks Survivor, Round 3 ~ The Bucky Channel - The World of Sports from Wisconsin's Perspective. It's another edition of the game which gives Bucks' fans the opportunity to show new GM John Hammond who we'd like to keep around for another season. It's also the 2,392nd "Survivor" knock-off since the show premiered about ten years ago! It's Bucks Survivor! Last Week: New GM John Hammond visited the tribes and put them through a rebounding challenge. The rookies, Team Todd Day, won the competition by an average of 4.68 rebounds per game compared with Team Eric Murdock's 3.47 rebounds per game. Desmond Mason of Team Murdock earned immunity, but one of his fellow veterans were about to go home. Results: It appeared early on that Bobby Simmons would be saying goodbye to Milwaukee. However, a lot push from the Dan Gadzuric haters made sure he would never wear the red and green again. Gadz ended up with 39 percent of the vote, compared to 16 for Simmons, 16 for Redd, 13 for Voskuhl, 11 for Mo Williams, and just 3 for Ruffin. Dan Gadzuric, the tribe has spoken. This Week: An inspired performance by Ramon Sessions Monday night inspired us to put the Bucks through an assists challenge. We don't want anyone on this team that is going to be a greedy ball-hog, so this challenge is appropriate. But would Sessions' 24 dimes be enough for his tribe to be safe for another week? Results: Even though we here at The Bucky Channel have admitted our love for Ramon Sessions, we swear this contest wasn't designed in his favor (but we're lying). The Vets go back on the block for another week, with Mo Williams, unfortunately, earning immunity. Will fans vote off some of the dead weight like Voskuhl or Ruffin? Will Redd place in the top three again? Can anything save Bobby Simmons? Voting can be done in the right-hand column of this page, and results will be posted Sunday, April 20th.